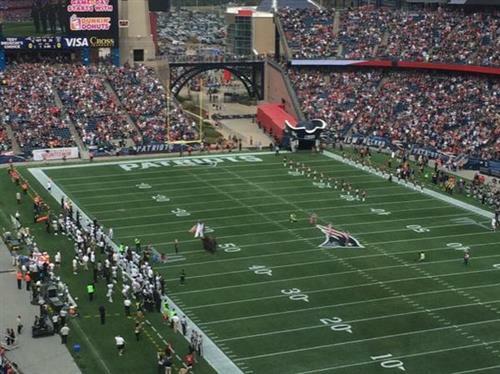 Get live updates, commentary and analysis of the Patriots-Raiders game from Boston.com's Zuri Berry, Erik Frenz and Steve Silva. There may or may not be snark involved. No promises. Tommy Boy on the field. I wish I could’ve lasted to see him change his intro song. Would’ve been a story in itself. 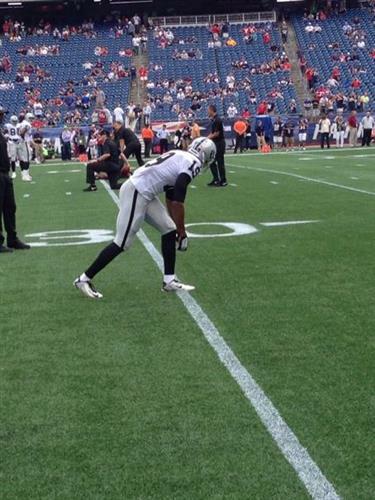 Very interested to see the kind of targets Kenbrell Thompkins, Tim Wright, and Danny Amendola get today. Belichick told @985TheSportsHub he interviewed with Al Davis prior to the 1998 season. They hired Jon Gruden instead. Jon Gruden over Bill Belichick? I guess more charismatic won the day. Both SB winners. 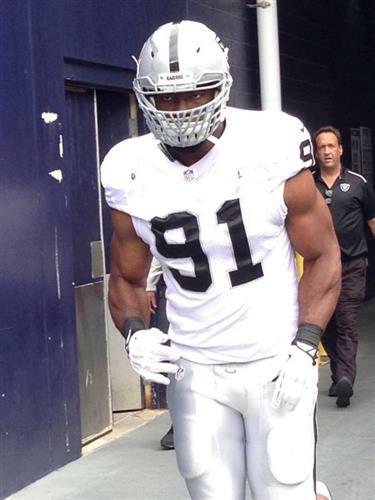 But one a sure HOF candidate. Chandler Jones warms up as the 3-4 defensive end. Memories of Miami already. 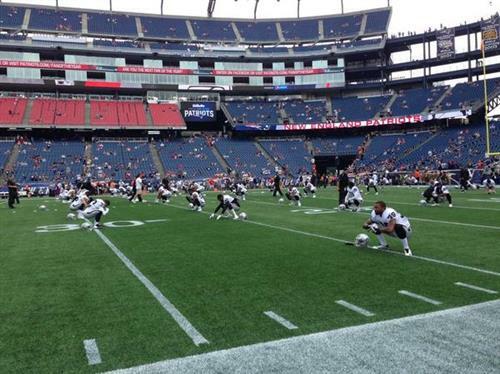 #Patriots line up in the 3-4 during warmups. Rob Ninkovich and Dont'a Hightower at OLB, Chandler Jones at 5-tech DE. Watch the game on @CBS or listen on @KFOX or @KBLX . Kickoff is coming up. Kraft gives Pats season-ticket holders the shaft once again.New handicap elevator access over half hour wait. It's 10' x 10'! Old way worked fine. Lots of unhappy customers. New handicap elevator access is a disaster! Over a half hour wait for 10' x 10' elevator. Old way worked fine. 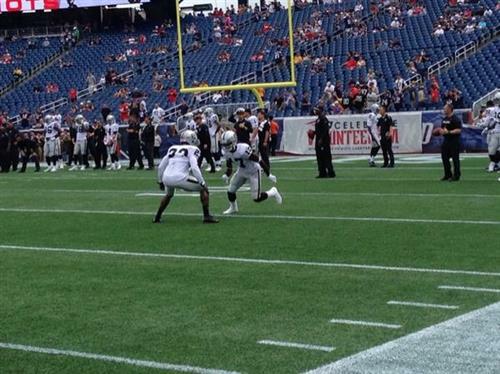 Raiders captains today are CB Tarell Brown, LS Jon Condo and Rb Darren McFadden. @Patriot sounds upsetting. Sorry to hear the day has started off so poorly. 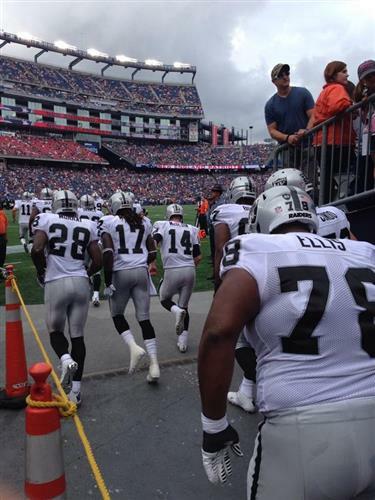 Patriots win the toss and defer their choice, the Raiders get the ball to start the game. 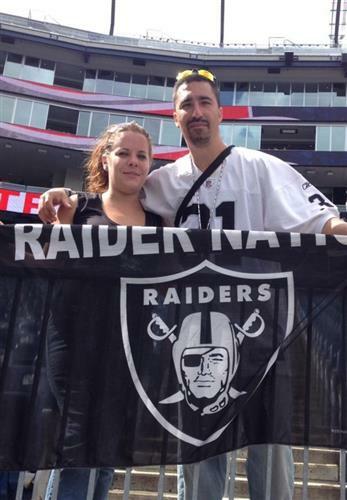 RT @957thegame : Catch #Raiders at #Patriots football NOW on 98.5 @KFOX , 102.9 @KBLX , or via this link: v6.player.abacast.net/2164! Patriots win toss, will defer. @Dan_Shaughnessy is pleased. RB @LataviusM back deep to receive. 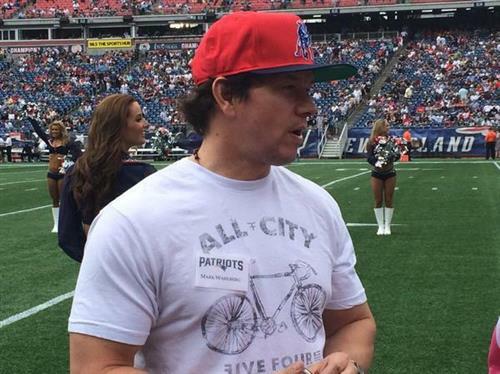 Patriots in a 4-3 over. Chandler Jones back on the outside. Good for him. Logan Ryan starts at RCB. Chung starts at SS. Siliga and Wilfork the main components of that defensive line. Ninkovich and Jones the others. Kyle Arrington comes onto the field for Jamie Collins. 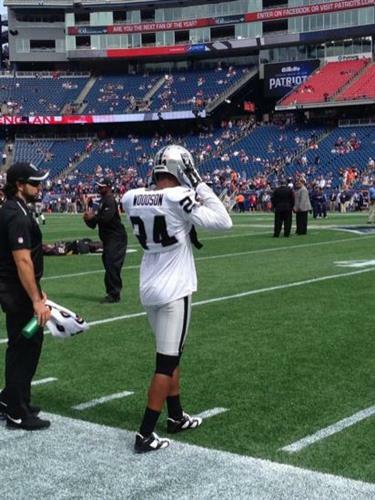 Let’s try that again… Kyle Arrington comes on the field for Jamie Collins… Logan Ryan got the start. Interesting that Kyle Arrington played on the outside with Logan ryan in the slot in nickel defense. Raiders forced to punt. 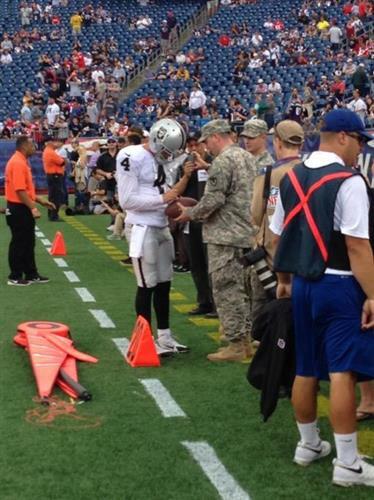 @MarquetteKing punts to Julian Edelman who fair catches at the 18. 1st and 10 Patriots. Patriots go three and out, P Ryan Allen comes on. Brandon LaFell logs his first reception of the season. Four yards on a screen.